Over the past decade, California’s off-and-on struggle with drought has underscored the critical need to use every drop of water sustainably. 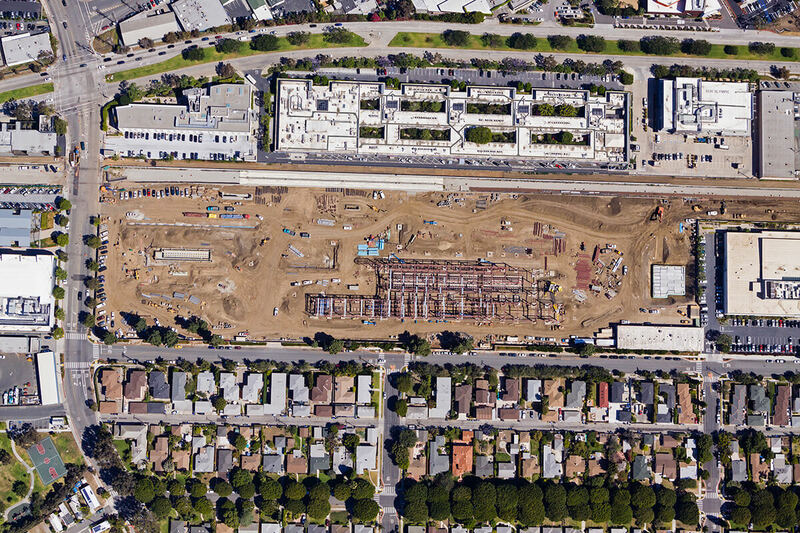 A recent project for the Santa Monica, California, Exposition Metro Line Construction Authority (METRO) was no different. Construction of their Expo Rail Operations and Maintenance Facility would have to meet demands for the region’s increased transportation needs, and create impermeable surfaces requiring assertive stormwater management approaches. 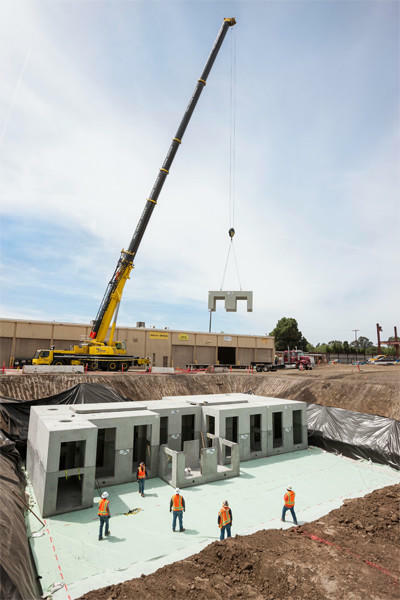 The new light rail Operations and Maintenance facility in Santa Monica requires an estimated 5,500 gallons of water per day for landscape irrigation, vehicle washing and other water needs to keep the facility running smoothly. Focusing on green building and energy efficiency, METRO officials sought a Low Impact Development (LID) design with zero stormwater runoff so that all rainwater falling on the property stays there rather than running off to the municipal stormwater system. Often, LID designs include stormwater infiltration, but for this project, poor soil conditions prohibited soil infiltration to replenish aquifers. The best option: stormwater harvesting for non-potable uses, an increasingly utilized solution to reduce reliance on municipal water. Oldcastle Infrastructure, A CRH Company, assembled a team to provide the solution. Kiewit Building Group, Inc. and W2 Design, Inc. supported the facility's lead designer, the Maintenance Design Group. This system allows water to be collected and stored underground and reused for various applications at the facility as needed. Because the entire system is below ground, the land above can be used for parking and other purposes, maximizing development on expensive real estate. The solution leverages across-the-board efficiencies in water use by reducing the impact on the municipal water supply, land footprint, system maintenance time, and budgetary concerns. “Oldcastle has a diverse portfolio of products that afforded the project economies of scale and the required 50-year design life,” Patrick Wong, P.E. W2 Design president. The StormCapture system occupies only a small footprint under the parking lot due to large storage capacity per square foot of area. 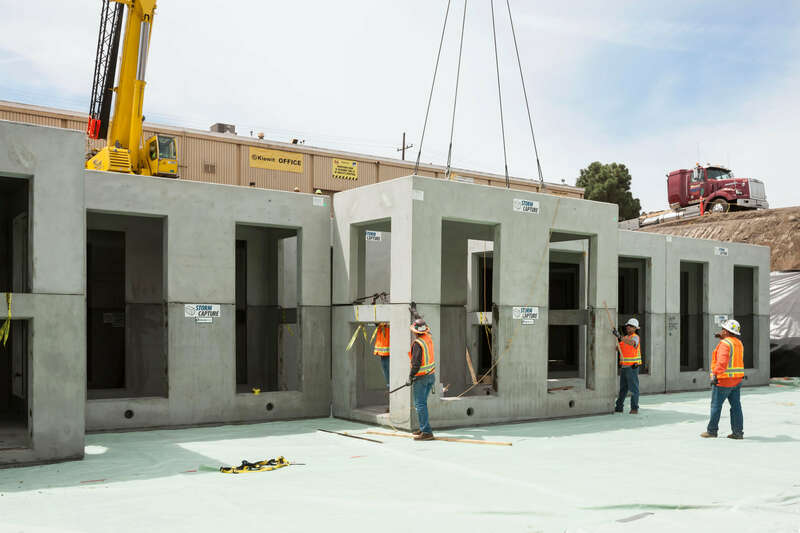 It encompasses 29 StormCapture precast concrete modules measuring 12’ inside height x 7’ W x 15’ L. One module is deeper and houses an integrated pump station to supply water for the harvesting system. 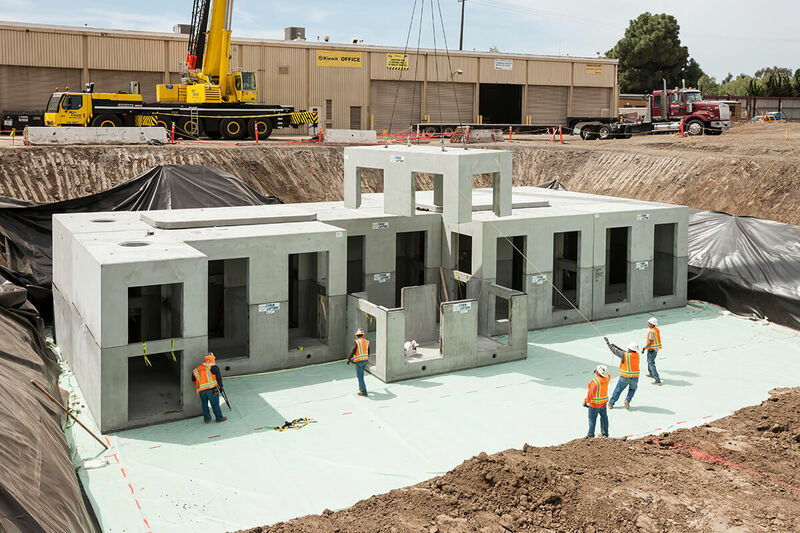 Pretreated stormwater flows into the StormCapture system’s concrete cistern modules, temporarily storing it for harvesting purposes. Water from the cistern then flows into the pump station module which also serves as an internal overflow bypass should the cistern be filled to capacity during a rain event. “We are able to capture all of their runoff in this one underground system, allowing them to keep their parking lot intact, provide the storage they need, and provide the sustainable benefits of harvesting water. In addition, the system was tested to confirm watertightness after installation,” says Jason Hermann, engineering manager for Oldcastle Infrastructure at the time. The harvested water will be used for irrigation of landscaping and train washing. California gets seasonal rains but the cistern is large enough to harvest retained water over a period of months to maximize the system’s value. The system also integrates OptiRTC technology into its stormwater harvesting systems, which uses predictive modeling to actively determine stormwater detention requirements and release stored water only as necessary to meet capacity requirements for each forthcoming storm event. OptiRTC monitors local weather forecasts to anticipate storm flows to detention within 24 hours of occurrence. It lowers cistern/retention storage levels ahead of the precipitation event and closes the outlet valve during storms to capture and retain water for harvesting. “Without the OptiRTC capability of actively managing the cistern level, we would have been required to meter out all detained water over a short period of time, minimizing any real value of the harvesting system,” explained Bauer. The stormwater management techniques utilized will contribute toward a LEED Gold rating for the facility and achieve METRO’s goals of water conservation, reuse, and green building practices. Every project is unique, with its own challenges requiring specific solutions. Take steps toward conservation by downloading our Guide to Stormwater Management eBook.